Side A – "Chronic Town"
Side B – "Poster Torn"
On the original vinyl release, R.E.M. labeled the A (or first) side (tracks 1–3) as the "Chronic Town" side and the B (or second) side (tracks 4 and 5) as the "Poster Torn" side. Both are lyrics in the band's song "Carnival of Sorts (Box Cars)". Chronic Town is the debut EP by the American alternative rock band R.E.M., released in 1982 on I.R.S. Records. 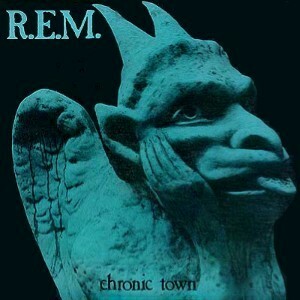 Chronic Town is the first illustration of R.E.M. 's signature musical style: jangling guitars, chords played in arpeggio, murmured vocals, and obscure lyrics. The EP was added to the CD edition of the band's rarities compilation album, Dead Letter Office (1987), its only current source of availability on CD. It is, however, available in LP and cassette formats. It was also bundled together with Murmur and Reckoning in the United Kingdom as The Originals in 1995.